Are you coping with dog cancer? If so, take a deep breath and remember that no matter what the prognosis, you can do something to help your dog fight cancer with three easy, uncomplicated and convenient steps. This post is sponsored by K9 Medicinals. 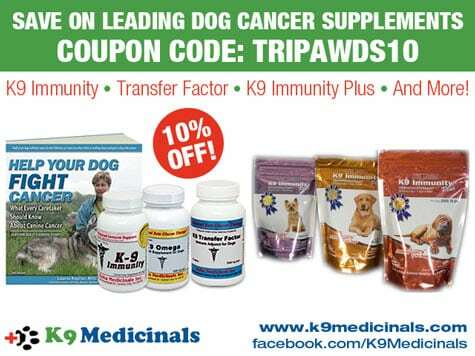 We are being compensated for helping to create awareness about K9 Medicinals’ dog cancer treatments, but Tripawds only shares information we feel is relevant to our readers. 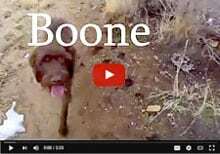 K9 Medicinals is not responsible for the content of this article. 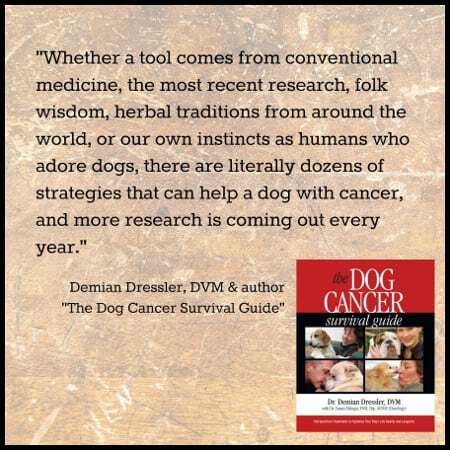 First, keep an open mind about different dog cancer therapies. Conventional veterinary cancer oncology and holistic treatments each have valuable benefits that increase your dog’s odds of beating cancer, so don’t rule either one out. In fact, the most forward-thinking dog cancer specialists will tell you that it takes a multi-faceted approach to control and ultimately work toward eradicating the cancer. 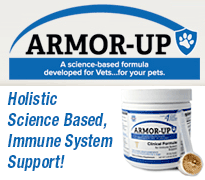 One tool that thousands of pets and people have experienced success with is the use of medicinal mushrooms. When it comes to clinically proven immune boosting supplements that do no harm, mushroom therapy ranks high on many veterinary cancer specialists’ lists. Cancer attacks the body’s immune system in order to grow. The next big step you can take to stop it is to boost your dog’s immunity so that it can recognize, destroy and work toward preventing cancer cells from overtaking the body. You can help do this with the power of medicinal mushrooms. 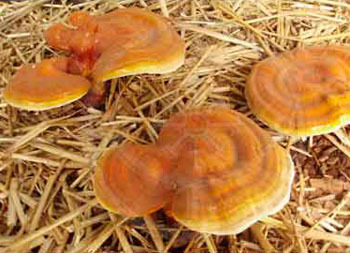 Both humans and dog cancer patients have experienced the power of medicinal mushrooms for decades. They’ve been well-studied for their anti-cancer, anti-tumor, immune regulating beta-glucans compounds. Some types you may be familiar with include shitake, but less common medicinal mushrooms include coriolus, agaricus and cordyceps. “And I found they work. They extend life, slow progression, and keep life quality high in dog cancer patients beyond traditional care expectations,” says dog cancer vet Dr. Dressler. Help dogs rebound from the effects of chemotherapy. But no matter how great of a chef you might be, your dog doesn’t want to eat heaps of mushrooms every day. So how do you get the power of medicinal mushrooms into your dog’s diet? That’s easy: K9 Immunity Plus™, a one-step, clinically proven, holistic way to fight cancer without the risk of side effects. Feeding foods with strong aromas and flavors are one of the best ways to perk up a dog’s appetite during cancer treatments. That’s why the folks at K9 Medicinals put the power of medicinal mushrooms into a single tasty, fish and liver flavored chew – K9 Immunity Plus™. 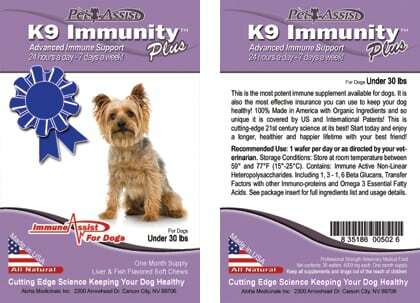 Along with your oncologist’s treatment plan, daily doses of K9 Immunity Plus™ can help improve the odds of keeping cancer away. This soft, tasty wafer is so easy to give! 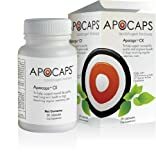 It contains the exact same effective ingredients previously only found in the pill form of K9 Immunity. 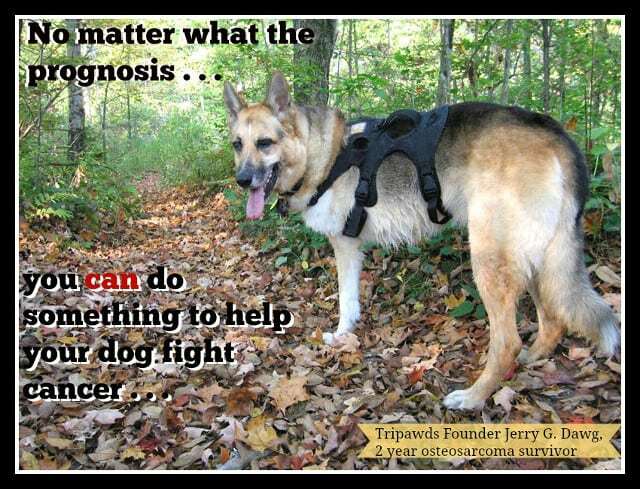 Over a million dogs have benefited from the power K9 Immunity, including Tripawds Founder Jerry and many other Tripawds members too. Pills are no fun for you or your dog, especially if you need to give many. But K9 Immunity Plus soft chews make it easy and tasty to give your pup powerful immune support and although you might not like the strong, fishy aroma of K9 Immunity Plus, your dog most definitely will! With each bite, you can feel good knowing you’re doing everything possible to help your dog fight cancer – with no known side effects that could compromise quality of life. Ingredients are listed in more detail here. 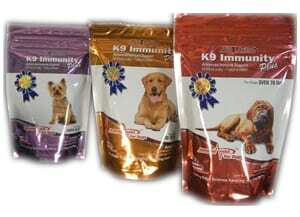 Costs less than buying K9 Immunity, K9 Transfer Factor and K9 Omega separately. We hope your dog continues to enjoy a long, healthy, happy life and appreciate this opportunity to share how K9 Medicinals has helped our Jerry and so many of our friends. We sincerely believe that it can do the same for your dog too. If you’ve tried K9 Medicinals, we want to hear about your experience. Please hop over to this “Eating Healthy” Discussion Forum Topic today! The only formula that turns on all 260 types of immune cells. This provides your dog faster and better results. Guaranteed to be free of dangerous toxins. Please note that we are not vets. The information presented here is not meant to be construed as medical advice or guidance, nor should it be substituted for veterinary assistance. Always discuss any remedies and treatments you wish to pursue with your veterinarian. This sounds good but are there any evidenced based studies that confirm it? Hi Dana, thanks for reading! 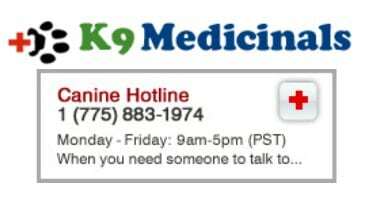 One of the studies we participated in is here and K9 Medicinals can point you to more by getting in touch with them. I hope this answers your question.